After researching New Zealand south island hiking options in the Lonely Planet guide “Tramping in New Zealand” we decided to hike a circuit in Nelson Lakes National Park. 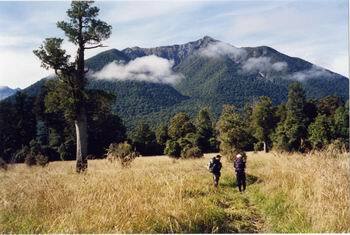 I was hiking with my wife Robyn and our 14 year old daughter Ineka and we opted to fly to Christchurch then hire a car to drive via Murchison to St Arnaud. 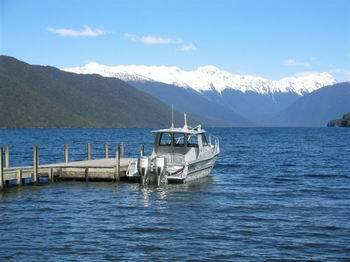 We would stay in St Arnaud and leave the car there while we hiked. 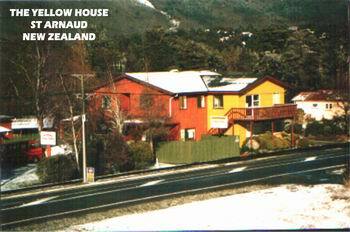 We chose to stay at the Yellow House, an excellent backpackers hostel, there are also other accommodation options in St Arnaud. Our trip was in early March, outside the school holiday period. The Lonely Planet Guide provided enough details to make our hiking arrangements from home in Australia and to choose a suitable route that matched our experience. The weather was kind to us. After snow and heavy rain the week before, our trip was in good weather, with some rain and low cloud. HIKE 1: Peter Kemp from Nelson Lakes Shuttles picked us up at the Yellow House and drove us in the shuttlebus to Lake Rotoroa, a distance of about 60 km. There we boarded a water taxi piloted by Kerry Simpson, of Rotoroa Water Taxis, who transported us the length of Lake Rotoroa speeding across 17 km of glassy water surrounded by lush forests. 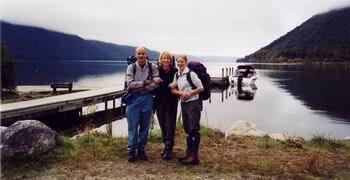 We landed at the D’Urville Hut jetty and after a quick look at the hut, started our hike. Our plans were to hike up the D’Urville River Valley to Ella Hut (day 1) then over Moss Pass to Blue Lake Hut (day 2) then down the Sabine Valley to West Sabine Hut (day 3) then to Sabine Hut back on Lake Rotoroa (day 4) then climb steeply over Mt Cedric to Angelus Hut(day 5) then along Robert Ridge to St Arnaud (day 6). Each day we had a comfortable hut to stay in, equipped with pot belly stoves, stainless steel sinks, running water and bunks to sleep in. What luxury compared with the lack of such facilities here in Australia. We carried a tent in case the huts were full, but we did not need to use it. 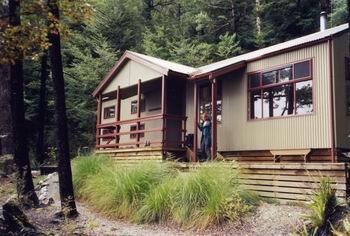 The system is run by the Department of conservation and generally the huts cost $10 per person per night (some with less facilities are only $5). The provision of these huts is a great safety feature as the weather can quickly change in the alps and having a hut for shelter for cook and drying your clothes makes the experience very enjoyable. They even have sandfly/mosquito screens on the windows. Pit toilets were also provided. Waterfalls. Crystal clear water. 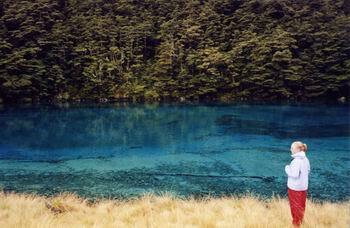 Turquoise blue lakes. BLUE LAKES! Jagged mountains and glacier-carved valleys. Sandflies. Cloud. Rain. Waterfalls. Mossy beech forests. Excellent trails. Easy navigation. Did I mention the waterfalls? Day 1: From D'Urville Hut we gradually gained height along the broad D’Urville valley. The river was low. We passed the (new) Morgan Hut after around 5 hours and theD'Urville River narrowed and the canyon walls were steep each side. Day 2: Leaving Ella Hut at 8.30 am in overcast weather, Ineka led the way. 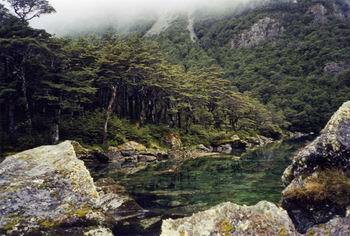 One hour upstream to the wire bridge crossing then a steep climb up a mossy chimney out of the myrtle and beech forest. 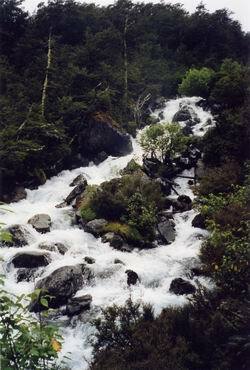 There was a bubbling creek at the top where we joined a spur. 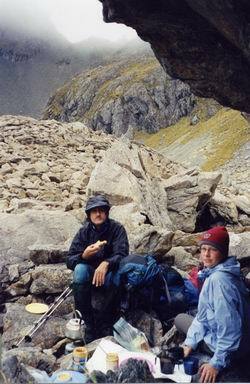 We had lunch in cold, windy and misty conditions near a tarn, just before the scree slopes leading to Moss Pass. 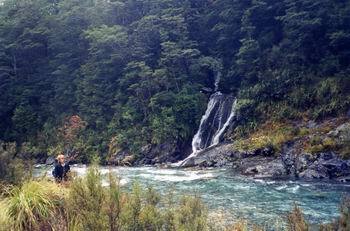 Day 3: We explored Blue Lake and its feeder waterfalls before departing at 10.30 am in misty weather for West Sabine Hut. Ineka dashed ahead leaving the oldies to potter along on this easy day hiking down a pleasant valley of the Sabine River. Excellent trout fishing spots along this river. Day 4: From West Sabine Hut the track follows the Sabine and just before reaching Lake Rotoroa a footbridge crosses high above the river. Another easy day. From the bridge you can look deep into the green water and see trout swimming around. 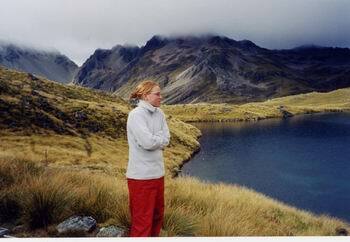 This was a good spot for a rest before completing the hike to the Sabine Hut on the edge of the spectacular lake. Today we had some rain and we were welcomed by clouds of sandflies, wasps and hover flies. Even some sandflies inside the modern hut. Day 5: Farewell to the lake and sandflies and a very steep hike up to Mt Cedric. The guidebook says more than 900 m climb in 4 km. It was cloudy and overcast. We saw a helicopter bringing trail maintenance staff. 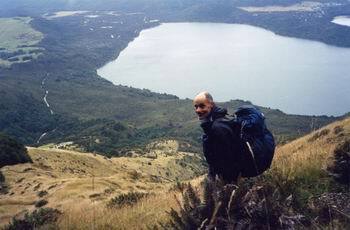 The climb was in forest then above the tree line it was cold and windy with only very occasional breaks to reveal views of the lake and the Mahanga Range opposite. We had all our warm clothes on by the time we reached the summit of Mt Cedric. 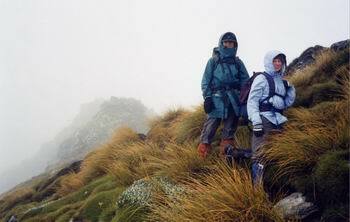 We had cloudy conditions all the way along the rocky ridges leading to Angelus Hut. We arrived in mid afternoon and found a very crowded hut. 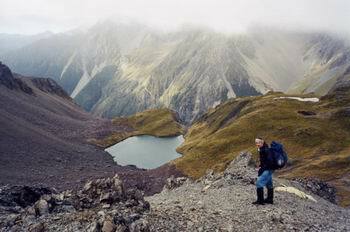 There were two overnight commercial trekking groups hiking up from St Arnaud. The weather outside was cold and wet so we crammed 40 into a hut designed for 36. We observed some interesting international negotiations for bunk space with some pushy visitors grabbing spaces from less pushy others. 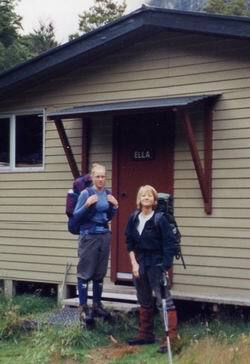 Two of our friends preferred to hike on towards Bushline Hut making a very long day. After we somehow managed to cook our meal we settled in to the bunks. The snoring that night was fully stereophonic and stylistic. (day total 10 km, 7 hours). Day 6: The morning weather was clear at first and we saw our first views of the Angelus Basin . 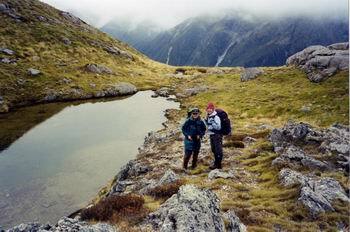 We climbed to Robert Ridge which is followed over Mt Robert (1421m) then the track descends steeply to St Arnaud. As we traversed the ridge the low cloud returned and we had windy cold conditions. 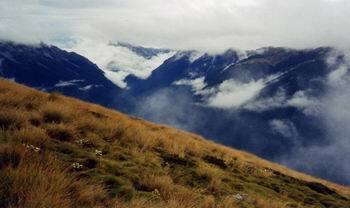 We saw lots of day hikers and some trail runners as we neared St Arnaud. The track ends at a car park leaving 7 km road walk to St Arnaud. After we started along the road we were fortunately picked up by Yvonne, the manager of the Yellow House, who was trail running on her day off. We enjoyed the hot shower at the Yellow House and had a fine meal at the cafe in St Arnaud, while noting the early closing of the store/service station opposite. 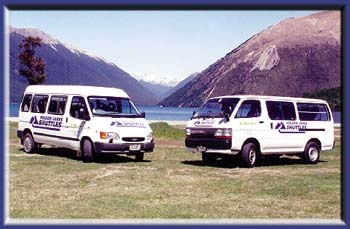 Next day we retrieved our car and headed for Nelson, then Motueka where we stayed in a Caravan park cabin. We checked out the Abel Tasman beaches, driving to Kaiteriteri then Marahau while Ineka went sea kayaking. We drove over the steep pass to the Takaka River valley and stayed at a beautiful country house near the coast at Pohara.